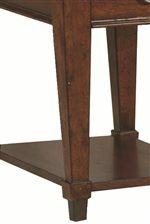 Rich and traditional in design, this round cocktail table is a fashionable centerpiece addition to the living room in your home. Featuring a lower display shelf, a box drawer with metal ring pull hardware, and a warm brown finish, this piece is sleek, understated, and functional. The sizable round top adds perfect functionality to any room. Pair this piece with the coordinating occasional tables in this collection to complete the look in your home. The Sunset Valley Round Cocktail Table by Hammary at AHFA in the area. Product availability may vary. Contact us for the most current availability on this product. Wood & Finish Warm medium brown wood finish. Handles & Hardware Round metal hanging handle pull hardware. Case Detail Slightly raised bases, with tapered legs, and topside edge moulding. Description: Top Wood grain finished tops on all case pieces. Add a healthy dose of function and fashion to the living room in your home with the Sunset Valley collection. Sleek, traditional furniture and a multitude of storage options throughout these pieces, make this smart grouping a lasting design choice for your home. These pieces are outfitted with shelving and drawers, as well as ring pull hardware, raised bases, and slightly tapered legs. Select a furniture collection that will last for years to come and will fit into a multitude of design styles, with the Sunset Valley collection. The Sunset Valley collection is a great option if you are looking for Traditional furniture in the area. Browse other items in the Sunset Valley collection from AHFA in the area.